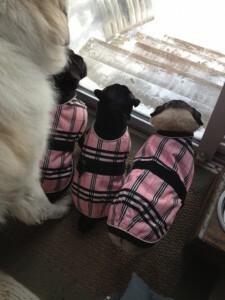 January was a whirlwind of activity here at SmartPak! Some of the highlights include launching the 2014 Horse Health Challenge and shooting a silly new video for our awesome new Refer a Friend program. 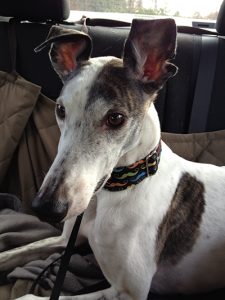 January was a very exciting month for me and my dog Amos the greyhound. Last October Amos and I started a specialized training class to help prepare us to take not one, but two certification tests 1.) 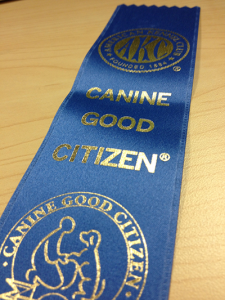 The American Kennel Club Canine Good Citizen® Test and; 2.) The Therapy Dogs International® Test. Going into the 8 week training course I had no idea what to expect from my good friend Amos. He had the inclination to sit for a cookie, but that was the extent of his obedience repertoire. So every Saturday we would head to class and meet our trainer Kris at the Dog Paddle in Bourne, MA to practice “sit”, “down”, and “stay.” As well as learn commands such as “leave it” and expose him to new things such as wheel chairs and walkers. Amos grew and expanded his skills every week and I couldn’t have been happier with his training. The classes not only helped to build his confidence, but my own as well. Amos after the big test, way to go buddy!